The NDVI Camera Unit is a custom NDVI camera for the DJI drone platforms. 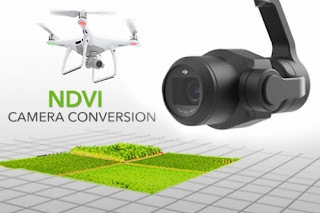 Upgrade your current platform into an NDVI crop scouting device instantly by simply switching out the standard DJI Camera and Gimbal Unit with the modified NDVI camera for the DJI Unit. We discuss about our all-new NDVI camera unit. What this is. This is a custom NDVI camera that we can install on your DJI Phantom 3 and 4 or DJI Inspire one with the X3 camera. What this let's you do is you're going to swap out your existing Phantom 4 camera and gimbal and install an NDVI camera for your drone applied to farming. The NDVI camera unit uses the original sensor and image capturing hardware but what we do is we modify the camera to filter solely red and NIR waves in an effort to maximize capability for a broad range of agriculture uses. NDVI is normalized difference vegetation index. It's calculated from the visible and near-infrared light reflected by vegetation. Healthy vegetation absorbs most of the visible light that hits it, and reflects a large portion of of the near-infrared light. Unhealthy vegetation reflects more visible light and less the near-infrared light. Double band NDVI imaging gives you many of the same benefits of multispectral imaging without the need for large and expensive equipment. This filter easily lets you see where vegetation is thriving and is not. When near infrared hits the leaf of a healthy plant it is reflected back into the atmosphere. As the amount of chlorophyll produced in a plant decreases less near infrared is reflected. This can be used to see the overall health of a crop. By post-processing the captured images, you can apply a color gradient that shows a contrast between healthy and non-healthy vegetation. Upgrade your current platform into an NDVI drone instantly, using DJI's exchangable gimbal design. This NDVI camera conversion is also available with all of Combo Kits at a discounted price, or as an individual item if you already own a Inspire 1 or Matrice 100. 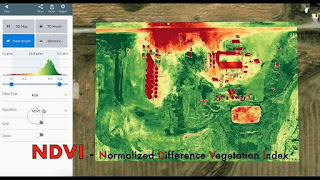 1 Response to " DJI Drone NDVI Camera Kit Applied to Farming"